Imagine living in a rural area where accessible healthcare just isn’t an option. When you’re sick, you’re hours away from professional help, and collecting essential medication or a vaccine is completely out of the question. This is the terrifying reality for thousands of people living in remote parts of Kenya. Fortunately for them, The Rural Transport Network is taking steps to tackle this problem head on. Training volunteers as health workers and equipping them with motorbikes and health supplies, the programme not only reaches some of the most isolated populations, but delivers preventative health education. 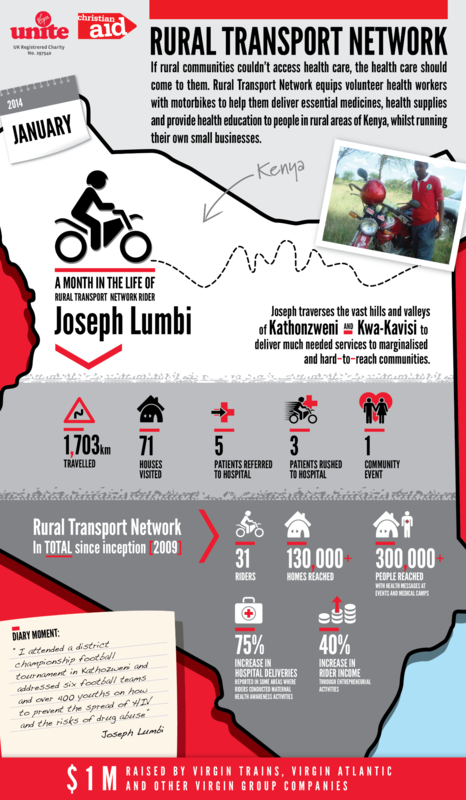 The infographic below showcases one Rural Transport Network Rider, Joseph Lumbi, and the results of the programme so far. The riders spend around half of their time volunteering as community health workers, and the other half running their own successful businesses. In order to recruit and keep quality volunteers, the RTN has recognised the importance of supporting these businesses through business training, mentorship, micro-loans and much more. But what’s even more amazing is the generosity of those involved in the programme. Donations from the volunteers' incomes cover petrol and maintenance of the bikes, ensuring communities continue to benefit from free or discounted services. Read a previous article about the launch of the programme. Find out more about the Rural Transport Network and support the programme today.